Toni Morrison, winner of the Nobel Prize in Literature in 1993, is perhaps the most important living American author today, and certainly one of the most popular in college and high school courses. Her novels, including "Sula", "Song of Solomon", "Beloved", and "Paradise", have won almost every major award available to them. In addition, her influence as a critic, book editor, and mentor to other writers has been incalculable. 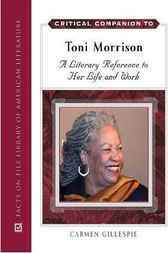 "Critical Companion to Toni Morrison" examines Morrison's life and writing, featuring critical analyses of her work and themes, as well as entries on related topics and relevant people, places, and influences.